New Chinese interest in oil search in occupied Western Sahara? The private owned Chinese company China Great United Petroleum (Holding) Limited could be close to taking over controversial rights to onshore oil exploration in occupied Western Sahara. The Irish/UK oil company San Leon Energy announced on its website 30 June 2017 that the Chinese company China Great United Petroleum (Holding) Limited could be taking over the small oil company. San Leon Energy has over the last decade held rights for oil search in Western Sahara. 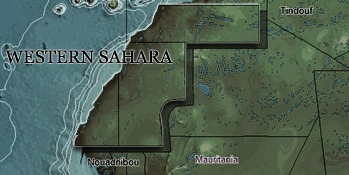 The last years, San Leon has held rights on two locations, both located on the international border between Western Sahara and Morocco, partially overlapping the two territories. The exploration programmes have not been done with consent from the people of Western Sahara, thus being directly contrary to international law as described by the UN in 2002 and by the Court of Justice of the EU in 2016. San Leon has stated - to the contrary of the UN and the CJEU that the people of Western Sahara "are not representative". Numerous investors internationally have blacklisted San Leon Energy from its portfolios due to the controversial operation, since it had not obtained permission of the people of the occupied territory. WSRW wrote in 2016 that the Chinese unknown Geron Energy Investment was taking over San Leon. From what WSRW sees it, there sees to be no direct link between last year's Geron and the new mentioned offeror China Great United. The offer from the now interested company is "conditional on it completing final due diligence to its satisfaction", and a formal bid would potentially take place in 45 days. The Chinese company is using GMP Securities as its financial advisor for the proposed transaction. It is not known who will undertake the important due diligence analysis, or whether this analysis will pick up that San Leon is holding a licence that is probably null and void, as Morocco is not in a position to sign an oil agreement in Western Sahara. The representative of the people of the territory on 1 May 2017 had a vessel detained in South Africa for carrying phosphate rock from the occupied territory, and a trial is waiting. Following the important judgment in the case between Polisario and the EU in the Court of Justice of the EU in 2016, Polisario has been hinting it will take legal steps against companies operating in violation of the wishes of the Saharawis. One is the Zag licence in the east, in which the company is in a dispute with its Moroccan partner over a delay in exploration programme. San Leon has blamed the local security situation for the delay. The other is Tarfaya licence near the coast. The licence covers the area from South Morocco to the capital of Western Sahara, El Aaiun. San Leon undertook exploration drilling near El Aaiun in 2016, to the protest of thousands of Saharawis. It is unclear whether San Leon still helds rights on this block, as it disappeared from ONHYM maps in 2016. San Leon, however, still claims on its website to have rights on that licence. An overview on ONHYM's website [or download], that is only seldom updated, shows that San Leon is not enlisted as an ONHYM partner for the Tarfaya block, confirming WSRW's suspision that San Leon has no longer rights on Tarfaya.